This vegan noodles with peanut sauce recipe is one of my favorite easy dishes to whip up on those nights where I'm very hungry, but just don't feel like cooking. 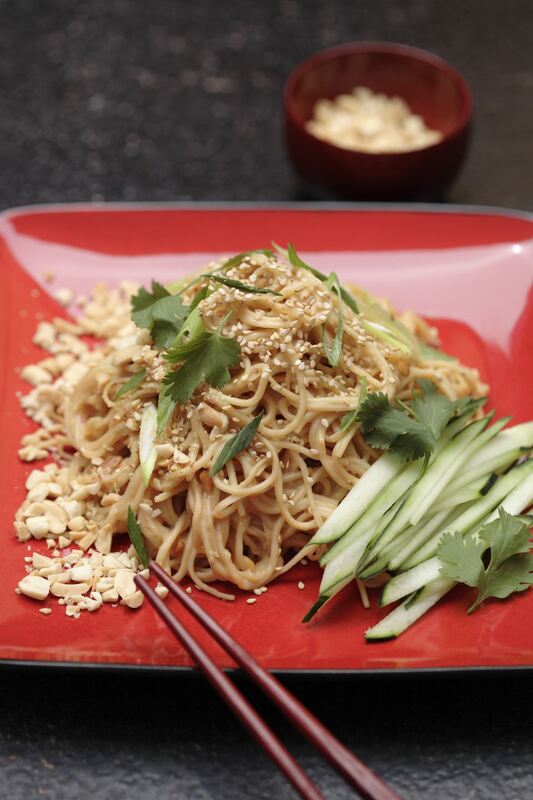 This recipe for spicy sesame peanut noodles is both vegetarian and vegan. It can be served hot or cold, so you might make a batch to enjoy again for a take-along lunch the next day. You can make this recipe with any noodles or pasta, including ramen, soba, or spaghetti. This Thai and Chinese-inspired recipe can be made less spicy by substituting red pepper flakes for the cayenne, or, omit the cayenne altogether. If you're looking for a Thai peanut butter sauce that the kids will love, this peanut sauce recipe is even tamer. You can find all of the ingredients in your local supermarket. Cayenne pepper is about half as spicy as the traditional Thai bird's eye chili peppers used in their dishes (you can find those at Asian markets). But it's peppier than jalapenos, so go easy if you don't like things spicy. You can find cayenne pepper powdered or as dried crushed red pepper flakes. Mince the garlic and slice the onions. Cook the pasta or noodles according to the package instructions. In a small saucepan over low heat, combine all ingredients except pasta and sesame seeds. Whisk carefully to combine all of the ingredients until the sauce is smooth. Pour the sauce over pasta or noodles, tossing gently to combine. Sprinkle sesame seeds on top, and serve hot or cold, as desired. This recipe makes three servings, and leftovers are delicious to chill and take along to work for lunch the next day. You can eat them cold or reheat them in the microwave. It's easy to double this recipe to feed more people or take as a dish for a potluck for a crowd. It is a safe item for a picnic as there is nothing to be of concern if left out at room temperature. If you are leery of commercially prepared peanut butter, you can grind your own from bulk peanuts in the bulk aisle of many supermarkets. Then you have only peanuts without the sugar and stabilizers found in the typical jar, and it mixes very well into peanut sauces.